"Before I say a single word, I must first express my everlasting gratitude to the City of Chicago and the Department of Defense today, for honoring the Halyard Mission. Until now, one of the most glorious moments in American history has been one of the best kept secrets of World War Two. Today, in Chicago, U.S.A., a dream came true for our group of former MIAs. There is no way to describe the enormous significance of what happened today at Daley Plaza. After 50 years, those of us who participated in the Halyard Mission reached the top of the mountain after a long journey to repay a long overdue debt of honor…Our debt is not only a personal debt, it is a national debt of the United States government and its people. It took Moses only 40 years to reach the Promised Land…it took us a little longer… "
"Today, we’ve reached the promised land…recognition of the greatest rescue of American lives from behind enemy lines in the history of warfare. How do you say ‘Thank you’ to the people that saved your life? Some people say to me, ‘Why are you doing this after fifty years?’ When somebody saves your life, what do you say – ‘Thank you, Charlie, I’ll see you tomorrow?’ When people thank me for doing a wonderful thing for the Serbs, I don’t buy that. If it weren’t for the Serbian people, I wouldn’t be here." Milton Friend tells me before I started ‘I know this is a long session, but could I squeeze in two minutes?’ Milton, please, say two words –"
"It’s hard to transmit…I get all choked up, but if these chetniks hadn’t of risked their lives, the airmen you see in this room wouldn’t be here…the airmen that they saved across the country wouldn’t be here…neither would their children or grandchildren, who today can walk freely in this country. They are living memorials of the Halyard Mission and the fact that the Serbian people saved them. 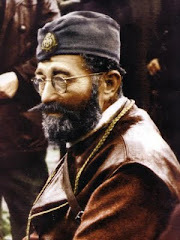 They are walking in this country today because of General Mihailovich and the Serbian chetniks..."
Nobody else, in the entire history of the United States government as ever said that, and today the American people joined us on saying ‘Thank you, and we appreciate it.’"
"If I digress once in a while, I hope you’ll bear with me. I get very emotional about these events, and it’s hard to follow a prepared few notes that I put down, so please forgive an old fogey to get through a very difficult time…"
"Let me tell you how I first got involved in the Halyard Mission. In early 1944, I completed my flight school training and was given a shiny pair of silver wings and a commission as Second Lieutenant in the Army Air Corps. Next thing I knew, I found myself in Lecce, Italy with the 98th Bomb Group, 15th Air Force, flying B-24 bombing missions over southern Europe. Early one morning, before a pre-takeoff briefing on a mission to Ploesti, our American Intelligence officer told us we would be flying over Yugoslavia that day, and to stay away from the Serbian people, because the Serbian people would cut off the ears of the American airmen! These were his exact words. This was the information that American Intelligence gave to the bomber crews that were flying out of Italy. The Serbian people will cut off your ears!" "Now, I heard this, and this is a complete about face from what I had read in Time Magazine. Time Magazine had a cover story on May 25th of 1942 calling General Mihailovich the greatest guerrilla leader in the history of warfare. So, I said to my Intelligence officer, ‘How come I read this in the paper and all of a sudden he does an about face?’ He said to me, ‘Lieutenant, don’t ask questions, just fly your mission. We have reports, top secret reports from British Intelligence…'"
"'...that Mihailovich is now collaborating with the Germans, see…’ He says, ‘In wartime, these guys, they play around, so just be careful…If you get shot down over Yugoslavia, stay away from the Chetniks. Look for the people with the red star on their hats…Tito’s communists (the partisans)….’"
"I remember this, fifty years ago. I mean, I don’t remember what I did last night, but I remember this fifty years ago…"
"Not only did they not cut them off, as you can see, but they grabbed me up, kissed me, put me on their soldiers like a conquering hero…To this day, I could never figure out, why only did the Serbian men kiss me, why didn’t the women kiss me!?" "Since that time, to expose this treacherous propaganda lie, the American airmen have been doing every possible thing we could to expose the thoroughness with which the truth was manipulated by the communists during World War Two. Let me give you a concrete example: I don’t believe what I read in the papers…I know what I see." "Let me tell you some techniques of communist propaganda. I went on some raids with General Mihailovich and the Chetniks…We raided a few German garrisons, forts…very successful…We came back. The next day or so, we turn on the shortwave radio. BBC from London says: ‘Tito’s partisans just completed a successful raid at such and such a village’ – the same place we went to just the night before…that’s how the truth was manipulated. Now, let me tell you, how would you feel – I just saw something, and the news reports say ‘This didn’t happen, something else happened.’"
"Supposing you go to Soldier’s Field here in Chicago. You see the Chicago Bears beat Denver in football. You get home, you put on CNN and they say ‘Today, the Denver Broncos wiped out the Chicago Bears.’"
"They completely distorted history. Today I’m still baffled by it. 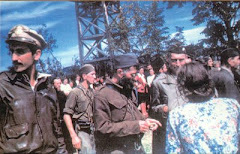 Now, the only thing wrong with it was that this was not a football game…this was the Serbian people I lived with – and the Chetniks would fight for their country and their freedom, and the Tito’s communists would get credit for it! To this day, this aggravates me. And it’s happening today too, believe me." "As the war stepped up, and we had raids of 250 bomber planes occurring every day in southern Europe, more and more airmen were being shot down over Yugoslavia. Many were sick and wounded and in constant danger of being captured by the Germans.The Americans who were shot down – we had no idea how and if we were ever going to get rescued. Let me explain to you how we faced the difficulty of how we would get back to Italy. We were deep in occupied territory. We had no prearranged rescue plan. And you can’t go to the corner phone booth and call up 15th Air Force headquarters and say, ‘Hey, we’re down here in Chachak, come rescue us.’ They don’t know where we are. 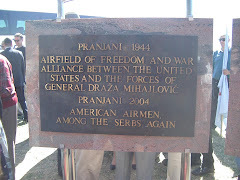 I was in Chachak, Pranjani, Breznica, Gornji Milovac – all familiar names, I’m sure, to some of you. But more importantly, the very friendly people that we were with, that were saving our lives, were abandoned by the Allies, because of the – can I use the word – screwed up intelligence of the British." "So the days, weeks, and months rolled by, and more and more airmen were getting shot down. We tried to contact headquarters back in Italy, but as I say, if we broadcast in the clear, number one, the Germans would intercept it. Number two, the Americans in Italy would say, ‘well maybe this is a trap.’ So, we couldn’t very well transmit in the clear. We were lucky – a brilliant man by the name of T.K. Oliver – he devised an ingenious system of American slang that the Germans could not intercept. Well, they could intercept it, but they couldn’t understand it. But the Americans could, and once they understood it, and approved of it – they said, ‘this is a legitimate transmission', and they formed the Halyard Mission, the secret Halyard Mission, and the rescue was on. At this time there were some 250 of us airmen who had been downed. The next thing we knew was that the night of August 2, 1944, Lieutenant George S. Musulin – his family…Oh, God…"
"His family is sitting right here. George parachuted in our area with two other members of the rescue team: Mike Rajachich and Arthur Jibilian. They brought with them a radio transmitter, an agreed upon code, and an evacuation plan. At the sign of Musulin’s team coming in – we didn’t know if anyone was coming in to rescue us, but when we saw George, we knew we were not being abandoned and that we were going to get rescued eventually. So when he came in, we let out a yell – you wouldn’t believe it – we knew that we were getting out of this place. The sad part of it was that there was a long delay before he came in. 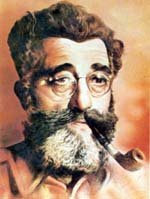 We found out later that the reason that George Musulin and his team were delayed was because the British objected to it. They objected to it, because they no longer recognized General Mihailovich. So, how could they send in an Allied team to someone that didn’t exist? So they objected to our being rescued. The only way it got approval, was that it went up to the White House, and President Roosevelt interfered, and said ‘I don’t give a blank about what the British care – I don’t care about embarrassing them – to me the most important thing is saving American lives – the hell with the British!’"
"I might add that after the war, Churchill admitted that abandoning Mihailovich was one of the biggest mistakes he had made of the war." Then on the night of August 9th, Captain Nick Lalich was went in by the O.S.S. to assist Musulin in the rescue operation. Once they were in place, Lalich, then later Colonel McDowell, working together with Mihailovich’s Chetniks, rounded up the Americans and other Allied personnel to carry out the most successful rescue operation of its kind in history. The other Allied personnel [to be rescued] consisted of British, French, Canadian, Italian, and Russian troops. When we came back to our base, there was no way we could talk about it, about our rescue, or express our gratitude, because our rescue had been classified top secret. Then when the war was over, we couldn’t tell anybody, because no one cared. But that wasn’t the end of the Halyard Mission, because as you know, it’s continuing to this very day, and there’s still one more chapter we’d like to finish – of national recognition of the Halyard Mission!" "Before I get into that phase of it, I would like to share with you the one experience that stands out in my mind about the people that saved our lives. Returning that day from bombing Ploesti, we were attacked by a group of German M-109 Messershmitts, caught fire, and were forced to bail out over 20,000 feet. The mention of it scares me, but I was a little younger then…"
"The Germans were in the villages, and they counted our parachutes as they came down. They knew where we were, but they couldn’t get to us. So they sent an ultimatum down to General Mihailovich. It said, ‘we know you have ten Americans. Either you return them to us, or we burn down a village of 200 women and children.’ Now, when we heard this, we said, ‘well we’re strangers in a foreign land. How can we be responsible for killing 200 women and children.’ We figured, well, we’ll turn ourselves in. The worst that can happen to us is a prisoner of war camp. Maybe we’ll escape, but no harm could come to us. 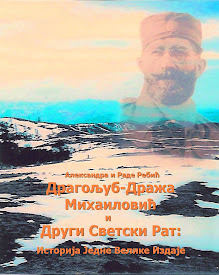 General Mihailovich said, ‘No, absolutely no.’ He said, ‘Let me tell you something about the Serbian people. We’ve been fighting our entire history for freedom – ever since Kosovo, Saint Sava, Tsar Lazar – we’ve been fighting for our freedom, our country, and our land. We have a saying, ‘Bolje grob nego rob!’ (Better the grave than to be a slave!)" 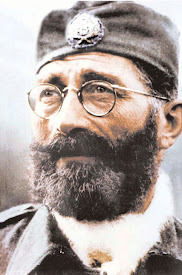 "He said, ‘Life without freedom means absolutely nothing to the Serbian people.’ He said, ‘If we return you to your base, and you drop one bomb on our common enemy, the German invader, you’ll do more for our country and our freedom than the 200 women…'"
"'…the 200 women and children that we love.’ He said, ‘That is our choice.’ And, the next day, I watched the Germans…Oh, God…"
"The next day I watched the Germans burn down a village of 200 innocent women and children. You know, you never forget that. Fifty years later, it still bothers me. Today, when I laid that wreath at Daley Plaza, I dedicated it to those 200 women and children. That’s the price paid for our freedom today, in this country.And not too many people know and are grateful for it. I may be running over my time, but I’m not going to stop until I finish what I have to say, and they can pull me off." I recall these sacrifices of 50 years ago every time I read in today's American press that the Serbs are murderers and some sort of two headed monsters." "Those that we met were all fine, decent, God-fearing people who were fighting for their freedom and their country. Were it not for them, there would not have been a Halyard Mission, nor would we have survived the war. I would also tell them in the strongest possible terms about the anguish that we Americans would feel to see our fellow Americans go charging with their guns blazing, to kill some of the very Serbian people who saved our lives. I don't believe our government should return their kindness and sacrifice by killing them." "I was very hesitant, because the American airmen have dissasociated themselves from anything political. Our only purpose - we're not making a political statement -- our one goal is the expression of gratitude for 500 Americans. That's all we want. But because of the situation today, I cannot refrain from saying something about the people who saved our lives. These are the people, who, when we were in trouble, helped us, and we cannot deny them today. To deny the Serbian people who saved us would be like denying the Holocaust ever happened. 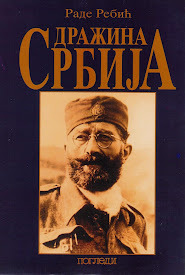 The Serbian people saved us. There's no two ways about it. This is the message we're trying to get across today -- Gratitude. I often say if it wasn't for the American airmen, the politicians in Washington would be speaking German today." 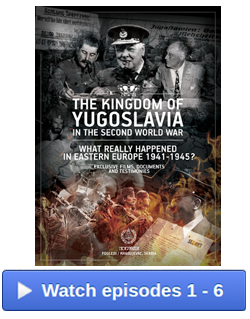 "After the war was over, as you know, we turned over the government of Yugoslavia to the communists. 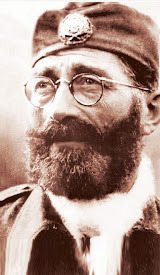 They seized upon the opportunity to capture Mihailovich, and in March of 1946, Tito announced to the world that they had captured Mihailovich and were putting him on trial as a war collaborator. ‘Mihailovich will be given a fair trial, but we have enough legal evidence to convict him, and he will be shot.’"
Now once that happened, put yourselves in our position. What do we do now ? The man was executed - murdered is a better word - so what do we do now? Thank God, along came the Honorable Edward J. Derwinski. Without him..."
Twenty years after Mihailovich was executed by a communist firing squad, Edward Derwinski came up -- he was investigating this for years - he came up with the fact that in 1948, two years after Mihailovich was shot - Secretary Derwinski came up with the information that President Truman, on the recommendation of General Eisenhower, who knew better than anyone else, on his recommendation, that President Truman awarded posthumously the Legion of Merit in the Degree of Chief Commander, to General Mihailovich for his material contribution to the Allied victory. Mind you, this is the highest award the United States government gives to a foreign national. This award was given two years after the communists shot him as a war collaborator. For the first time in the history of this country, because of the "behind the scenes" activities in Washington, this award was kept secret. The first time in history, one of the highest awards was kept secret. 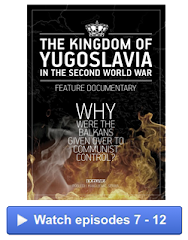 The State Department finally admitted - 'well we did not want to release this because we did not want to offend the communist government of Yugoslavia.’ This is in an actual document! So, it's okay to offend the Americans, but don't offend the communists! Now, doesn't that just burn your pippi?!" "I left my files with him. And thank goodness, shortly after that, I received a letter from the Superintenant of the Air Force Academy, Lieutenant Charles R. Hamm that 'in the future, the Halyard Mission and the efforts of General Mihailovich would be on permanent display at the Academy, and it was sure to be of great interest to the cadets.'" The State Department is still on record for saying 'we do not care about the truth. 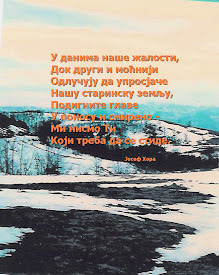 Our only concern is appeasing Yugoslavia.' It seems that our State Department has a desk in every country of the world, except the United States of America." "Not to long ago, the Washington Post called to ask me 'how come after fifty years, the United States government has never expressed its gratitude for the lives of 500 Americans saved during the war?’ Excellent question. I can't answer it. I told them it was not our fault. I told him, we've been giong to Washington for fifty years. Unfortunately, we don't have any money to buy a lobbyist. Without a lobbyist in Washington, you have absolutely no political clout. All we have working in our favor is truth, justice, national honor, and gratitude to a former ally. Those values mean absolutely nothing in Washington when they come up against powerful foreign lobbies. When they come against powerful public relations firms and million dollar contributions given to our elected officials. Believe me, it disturbs me greatly to stand up here in uniform..."
Major Felman pauses to compose himself. "It disturbs me greatly to make these accusations about some of the people I met up in Washington. I don't like to do it, but I would be unpatriotic and un-American if I didn't bring it out. He says to me, 'thank you very much. We appreciate what you're trying to do, but the petition for Mihailovich is being denied,' and I quote, 'because of the opposition of the Yugoslav Government and the opposition of certain ethnic groups in Yugoslavia.'" I broke four windows when I got this letter. In my wildest dreams, I never thought I would live to see the day when a committee of the United States Congress would allow an ethnic group to interfere in our internal affairs! Besides that, and this is the important thing, it sets a frightening precedent that the legitimate requests of American citizens are denied by the United States government on the basis that they might upset a foreign government. After trying all these years, I will never accept the fact that, during World War II we risked our lives and watched our buddies get their arms, legs, and heads blown off so that ethnic groups could tell us what we could or could not do in our own country!" "I don't know if I'll ever get another opportunity to release my sense of outrage. Two days ago, on May 29th, I celebrated by 73rd birthday..."
"You know as well as I do, I don't have another fifty years to fight for a cause as American as the American flag, the Star Spangled Banner, and the Bill of Rights. Gratitude. American gratitude. That's all we want. For 500 American lives. For a birthday present, I was going to ask our featured speaker, the Deputy Secretary of Foreign Affairs, to conduct a full scale investigation of why ethnic groups in Yugoslavia are more important than 8 million American veterans?" I am an American with a fierce love for my country. I have red, white, and blue blood flowing in my veins. But I am absolutely put to shame by a mere handful of my own countrymen who would dare to oppose an expression of gratitude for the saving of 500 American lives while we were fighting in defense of our country. The American airmen will always be greatful to them. To the committee chairman, Colonel Kenneth Plummer, and to one of our Serbian chetnik rescuers, Rade Rebic and his wonderful family who have worked hard day in and day out to put this ceremony together and give us this recognition." "And to hell with what the ethnic groups in Yugoslavia think about it! Major Richard Felman walks off the stage to a standing ovation from the audience. NOTE: I had the great fortune of being able to see Major Felman two more times when he again visited the Chicago area - once in 1996 when he attended the 60 anniversary commemoration of General Mihailovich's execution, and at another event in 1998. By that time, he was already sick with ALS (Lou Gehrig's disease), but he wore his WWII uniform proudly and honored us with another one of his wonderful speeches about Operation Halyard. He never gave up the fight. His debt of honor continued to motivate him to the very end of his life, and his enthusiasm, dedication, loyalty, and incredible tenacity continues to remain an inspiration to me 10 years after his passing. He lost his battle with ALS in November of 1999, but I know that wherever he is today, he is mighty pleased with the progress that has been made in securing national recognition for the Halyard Mission, his dream.